For the past five years, the Women, Wealth and Wisdom workshop has empowered more women to take control of their finances by providing expert insights and advice. Attendees at the Texas A&M Foundation's 2015 Women, Wealth and Wisdom seminar. According to the National Center for Women and Retirement Research, as many as nine out of 10 women will be solely responsible for their finances at some point in their lives, and the Texas A&M Foundation aims to prepare women for that moment. The 2016 Women, Wealth and Wisdom workshop will be held on Friday, May 20, from 8:15 a.m. to 3:15 p.m., at the College Station Hilton Conference Center. This free event welcomes women of all ages and includes expert presentations on financial and estate planning, savings, investing and Social Security to encourage women to take ownership of their finances. Through this workshop, mothers learn about the importance of guardianship and financial inheritance for their children while other attendees participate in interactive sessions focusing on eldercare. Participants also have the opportunity to contribute to a conversational session about charitable giving. 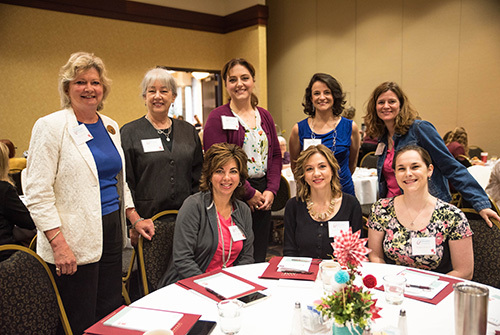 “Each year, we strive to make Women, Wealth and Wisdom better than the previous year, providing valuable information that will resonate with women in any stage of life,” said Angela Throne ’03, gift planning officer at the Texas A&M Foundation and co-chair of the event. Since the annual workshop began in 2012, the participation has seen dramatic increase. Last year more than 260 women attended the event, compared to the 135 who attended the first year. This year’s workshop will also include sessions on aging parents, estate planning, communicating with your physician and budgeting for your bucket list. One of the more exciting aspects of the workshop is the keynote speaker, who closes out the day. Past years have featured speakers such as Gary Blair, a meteorologist, philanthropic advisors, and Melanie Shankle, blogger and well-known author. This year’s keynote address will be given by Karen Walrond, a Houston-based lawyer, speaker, author and photographer. A 1988 graduate of Texas A&M University with a degree in civil engineering, Walrond is well-known for her website Chookooloonks. Her presentation will be based on her bestselling book, The Beauty of Different, a celebration of the many ways we are all unique. Walrond speaks worldwide on leadership development, creativity, diversity and social media. She has presented at TEDxHouston and appeared on a variety of media outlets including PBS, The Huffington Post, CNN.com and The Oprah Winfrey Show. “This year, we’re especially excited to have a panel predominantly comprised of Aggie women who will empower attendees to stay actively involved in their long-term financial and estate plans,” said Throne. Because breakfast and lunch will be served, registration is required.